Brick Town Talk: Build and Win a Free T-Shirt! - LEGO Town, Architecture, Building Tips, Inspiration Ideas, and more! A couple of weeks ago, I got a terrific offer from the good folks over at RedBubble, a site that specializes in all sorts of custom art works, in giving away three free t-shirts to the readers of Brick Town Talk. All you have to do is construct a NEW building or structure. There is no limit in size or shape. Build it big or small, it doesn't matter. The top three winners will be redirected to CEO Martin Hosking of RedBubble to polish off the details. Submit your entries to bricktowntalk@gmail.com. I'm doing it this way because your email will be needed in finalizing what you want from RedBubble. Deadline will be June 18th. I have three of the following shirts from RedBubble's "LEGO T'shirt collection" to give away for the top three models over the next two months. 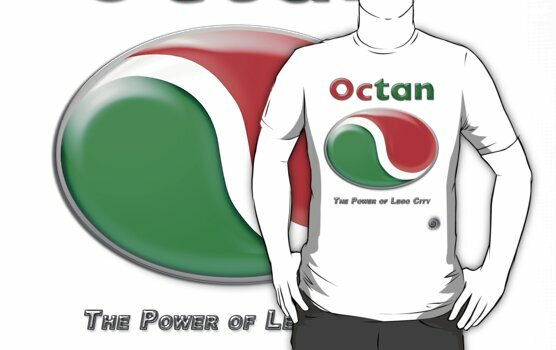 Now since a lot of you are LEGO city fans, I think you'll like the OCTAN shirt the best, designed by "timeprowler", but that's just me. There's plenty to choose from. All entries will be reviewed for authenticity before they are considered. This is my first time running a competition, so please feel free to raise your questions! Hope you will enjoy this! Build something good so you win a t-shirt! Thanks again to RedBubble for sponsoring this competition! When does the competition end and does it have to be a new building? Yep, must be a new building. The contest will end June 18th. Thanks for your question! I'll add this into the description. While the T-shirts are undoubtedly cool, I wonder if they have permission to use some of the MOCs that they have on the shirts. I'm much less concerned about fans "infringing" on LEGO trademarks than I am vendors taking advantage of the work LEGO fans put into their designs -- like the Pulp Fiction guys by minifig. Can I enter from Australia? Is there a limit to the number of pictures? Can the pictures be posted to Brickshelf or flickr and then email the url to you, or should the pictures be emailed directly to you? Is there a size limit on the pictures? Sorry for the late response, I hope you can still enter!